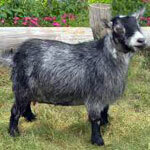 First found in Africa and originally known as Cameroon dwarf goats, pygmy goats were imported into the United States in the early 1950s to be displayed in zoos and used in research facilities. 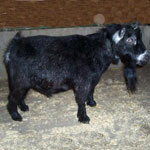 Because of their friendly personalities and ease of care, they quickly became popular with private breeders. 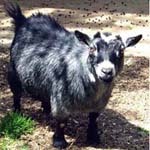 In fact, pet pygmies have been likened to having dogs as pets since they can be affectionate and will bond with their human companions. Some people have even house-trained them! 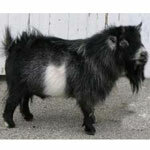 They are smaller than most goats, growing to be between 35 and 80 pounds, not unlike many other pets. Females, called does, and castrated males, called wethers, make the best pets. 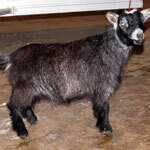 Males that are not castrated, called bucks, are not typically found to be pets. While likeable enough, they have an odor that many people find offensive and unpleasant. Bucks are also quite strong, often have biological urges to mate and therefore can be quite difficult to live with. 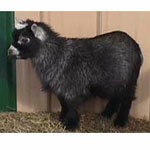 Pygmy goats come in three main color categories - caramel, agouti and black. 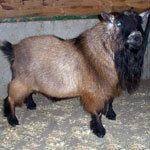 Caramel shades range from white to buff to dark tan undercoats. 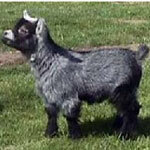 Agouti shades include grey, brown or black colors intermingled, or grizzled, with white hairs. Blacks are pretty self-explanatory, with a solid black body pattern. 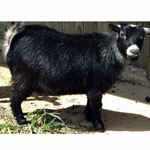 Sometimes pygmies also have white markings on their belly or legs. 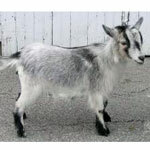 Many of these white marks are considered mismarks by the breed standard, but pet owners find them interesting and actually prefer these out of the ordinary marks for their pets.